The publication of this book marks the culmination of Brian Reynolds' lifelong interest in the 'Live Light Music' which was such a feature of BBC Radio's Golden Age. The author, who is the acknowledged expert on this subject, has amassed an amazing collection of off-air recordings of MWYW and similar programmes, including Bright And Early and Morning Music; he has even given much of this material back to the BBC Recorded Archive! In today's world of 'personality presenters' playing interminable pop records, it may be difficult to appreciate that there once existed a very different broadcasting environment where live music in general - and MWYW in particular - was ubiquitous. Not only did the latter make an immense contribution to the whole institution of Radio for twenty-seven years, but it has effectively become a piece of Twentieth-Century British social history. Reynolds charts the course of the programme from its inception in the dark days of 1940, when it was conceived as a morale-booster for wartime workers, especially those employed making munitions. Thousands of factories were equipped with sound-reproducing systems - another thriving industry - and the immediate result was a substantial improvement in productivity. Conversely, failures by managements to remember to 'switch on' were reported to have caused near-riots! The number editions reached a peak of three per day, seven days a week, with some even being repeated at breakfast time under the title Music In The Morning. There evolved a sizeable corps of orchestral players, conductors, composers, arrangers and 'fixers'. For more than a few, it was the principal source of their livelihood, and it necessitated the creation of its own dedicated administrative bureaucracy at the BBC, which was convinced that all this made a real contribution to the winning of WWII - a claim which is probably well-justified. The post-war years saw the acquisition of additional home-listeners, (a figure which rose to some 4-million), whilst its popularity in the workplace, even by 1962, was found not to have diminished. However, MWYW did begin to experience competition from commercial companies selling 'piped music', although not all establishments found this to be as effective as the original product. Eventually, it was abruptly and unceremoniously axed, the innocent victim of a fundamental change of policy, in 1967. This caused an expected backlash from industry, but curiously almost no reaction from domestic listeners - notwithstanding that, by then, the great majority of the afternoon audience was in the home. There were, however, some in the Corporation who continued to champion the programme; this resulted in several periods of revival in the 1980s and 1990s, before its final demise. A measure of MWYW's importance lies in the fact that, for many years, the morning edition was transmitted simultaneously on the Light Programme and Home Service, and thus constituted the only output available on BBC Radio between 10.30 and 11.00 am. No wonder then that a whole generation, (including Brian Reynolds and myself), grew up listening to and enjoying the programme; how fortunate we were to have been born in the right place at the right time! Within its 255 pages, the volume contains the biographies of over fifty musical directors who helped to achieve MWYW's success, and who in turn became 'household names'. Sadly, many were rapidly forgotten, (and in a number of cases suffered severe hardship), after the BBC mandarins 'pulled the plug' with the advent of Radios 1 and 2. Well produced in hardback format, the book is considerably enhanced by the inclusion of eighty photographs and a comprehensive index. There are over one hundred programme 'menus', together with a complete list of all participating musical ensembles and instrumentalists; this reads like a veritable Who's Who of the then-current music profession. With a foreword by journalist and broadcaster Howard Leader - who was its prime instigator - MUSIC WHILE YOU WORK-AN ERA IN BROADCASTING has been meticulously researched and authoritatively written by a passionate devotee. 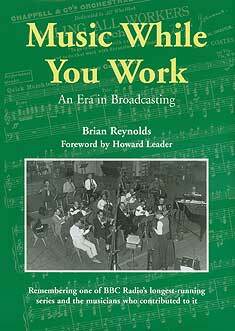 It undoubtedly deserves a place in the library of every Light Music lover and student of Radio Broadcasting history. The book is available by e-mail from the author for £12 (+ £3 pp, UK only). Cheques are only accepted from UK purchasers. Non-UK purchasers please note: Payments are only accepted via Paypal and additional postage rates to be agreed. "The acknowledged expert on this subject charts the course of the programme from its inception in the dark days of 1940 ... meticulously researched and authoritatively written by a passionate devotee." The Robert Farnon Society, The Light Music Society Journal and the British Vintage Wireless Society magazine.